Here are the stories that you, the readers, read the most in 2011. 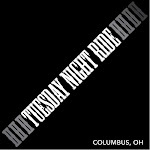 Thank you for taking the time to read Columbus Rides Bikes blog in 2011! Our traffic DOUBLED from 2010 to 2011. Look for continued posts on the blog in 2012. Sometimes it is the simple things that bring the greatest joy, and that's why Salsa's newAnything Cage is going down as my personal pick for 2011 Touring Product of the Year. For most of us, this oversized cage will be mounted to the standard water bottle eyelets, but it can also be mounted up to Salsa's Enabler and generation 2 Fargo forks. The purpose of the Anything Cage is to provide some extra gear or hydration storage with a very small time and monetary investment. I've seen it used to carry a sleeping bag, stuff sack of clothing, and a sleeping pad. 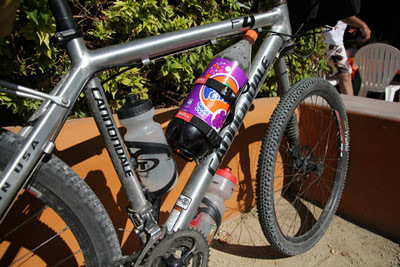 On my most recent trip, I used it to maintain a steady supply of grape flavored Fanta (see photo above). The cage installs as easily as a standard water bottle cage, and your gear is secured with a pair of included nylon straps. At $25, you pretty much can't afford not to get one. TOURING GEAR AND TIPSis written by Joshua Tack of Adventure Cycling's member services department. It appears weekly, highlighting technical aspects of bicycle touring and advice to help better prepare you for the journey ahead. Continuing our look back at the last 12 months, we take a look at the road tyres that had our testers raving about rubber. From the fast, benchmark-setting Michelin Krylion Carbon to the tough as old boots Schwalbe Durano Plus, we've reviewed racing and training tyres for all types of road cyclist. While the prices and specifications of these tyres vary, they all have one thing in common - a top rating. SeaSuckers are vacuum cups, not suction cups. There's a big difference between the two. Our vacuum cups are bigger, which means they're stronger, so you can always count on them to keep your bike safely mounted. The 6" SeaSucker will pull over 200lbs! That amazing strength is combined with an incredible safety feature not found on suction cups. When a SeaSucker starts to lose vacuum (and it will lose some vacuum over time - it's not a permanent mount), it will let you know. The SeaSucker's built-in finger pump will reverse itself as it loses vacuum, exposing an orange band. When you see orange, you don't have to take it off and lick it - just give it a couple of pumps, and then you're back to full strength. Joy Machines Bike Shop is a full-service community-oriented startup bike shop in Ohio City’s Market Square District, jointly owned and operated by Ohio City natives Alex Nosse and Renato Pereira-Castillo. The concept for the shop was born in the winter of 2010 and we opened our doors to the public in the summer of 2011. Joy Machines caters its products and services to everyday cyclists and commuters, as well as any all individuals interested in integrating bicycles into their daily routines. Both owners are committed and passionate transportation cyclists and envision a healthier more vibrant Cleveland where bikes are a more prominent mode of transportation. 24-year-old Brooklyn local, ex-NYC messenger and full-time racer Dan Chabanov is aiming high and rightly so; Chabanov has climbed from a CX Four to Elite in less than Two Years. Columbus, Oh. - December 28, 2011 - Stanridge Cycles, a small boutique bicycle builder in Columbus, Ohio has been tapped to build Chabanovs’ 2012 Red Hook frame. The Red Hook Criterium is an unsanctioned bicycle race through a desolate post-industrial area of Brooklyn NYC. The race enters its Fifth year this March 24th. The secretive course changes locations every year. The only constants are track bikes only, 20 laps around a three-quarter mile course and an 11 PM start. Stanridge Cycles’ Adam Eldridge states “I’m very excited to have the opportunity to build a bike for Dan to race in the Red Hook. He’s a grounded guy with a great future in front of him. We’re excited for the feedback from an Elite racer as it pertains to our frames.” Stanridge Cycles has been in business for three years. Eldridge says, “I’m very lucky to have a strong group of volunteers, supporters and two very involved business partners. I couldn’t ask for anything more at the moment except for time.” Stanridge is a compound of Eldridge’s grandfathers’ surnames. To commemorate the event Stanridge is building five complete Red Hook race replicas. ROADS WERE NOT BUILT FOR CARS is a free e-book about roads history, focussing on the period 1880-1905, which saw the Bicycling Boom and then - pop - the start of Motoring Mania. Motorists are the johnny-come-latelies of highway history. The coming of the railways in the 1830s killed off the stage-coach trade; almost all rural roads reverted to low-level local use. Cyclists were the first group in a generation to use roads and were the first to push for high-quality sealed surfaces and were the first to lobby for national funding and leadership for roads. Without cyclists, motorists wouldn't have hit the ground running when it came to places to drive this new form of transport. 'Roads Were Not Built for Cars' is a history book, focussing on a time when cyclists had political clout, in Britain and especially in America. The book researches the Road Improvements Association - a lobbying group created by the Cyclists' Touring Club in the 1880s - and the Good Roads movement organised by the League of American Wheelmen in the same period. The book will be published in April 2012 and, thanks to research grants and advertising support, will be free to read online and free to download to Kindles, iPads, iPhones and other e-book readers. The free distribution model will be used in order to get the book seen by as many eyes as possible. What an amazing year it’s been! Your generosity created shiny two-wheeled holiday miracles and lifetime positive memories for 345 children under the care of Franklin County Children Services! Thank you! We raised over $27,000 in monetary contributions, plus an additional 14 physical bike donations. Your generosity is truly astounding. Every bike included a lock, although we ran short on helmets. The website has been updated with pictures, video and donor names. Take a moment to review. EVERY contributor turns this annual effort into realty, from the large donors to the friends who simply share our Facebook posts and emails. We appreciate each of you. The 2011 Bike Lady season will extend to the first week of 2012 thanks to Groupon which will offer a $10 charitable Groupon to its entire central Ohio subscriber list. Purchasers of the Groupon will get a great feeling knowing they are helping to put more local FCCS kids on bikes and Bike Lady gets the entire $10 for each donation. We thank Groupon in advance for underwriting this campaign and expanding the reach of our mission. Adding the 345 bikes of 2011, Friends of the Bike Lady have provided over 1,200 bikes, helmets and locks to FCCS kids over the last four years. Words will never be sufficient to express my gratitude for your support. I hope it’s satisfaction enough just knowing that what you’ve done year after year is truly astounding. You have positively affected and changed the lives of so many children in a simple, yet miraculous way. May the New Year bring you many blessings for you are a blessing to others. Yehuda Moon and the Kickstand Cyclery is starting up again in 2012! Along the way, you'll meet ('first appearance' links) the bike ninja, the bike hypochondriac, Yehuda and Joe's elderly compatriot Fred, Thistle Gin (a mechanic who works in the shop with Yehuda and Joe), the Shakers who build the bicycle frames, Kevlar Bead (owner of Rival Cycles), neighborhood kids, roadies, commuters, and many, many more. 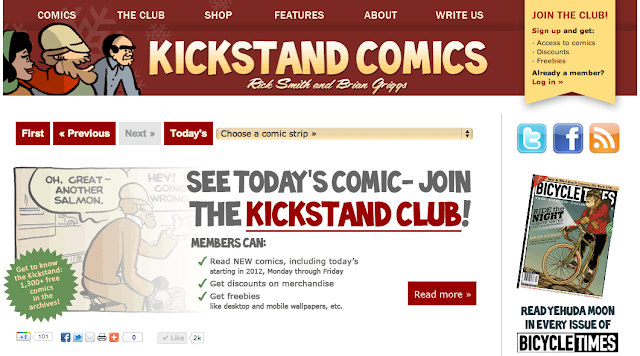 Get to know the Kickstand Cyclery by reading through our comic archives or reading the best of Kickstand Comics. Here's a short YouTube video of the May 26, 2008 comic being inked. I (Rick Smith) created, write and draw the comic strip. Notes are kept in a book which get turned into stories and dialogue on cards or in e-mails, which then get sorted and organized (over and over sometimes). I usually pencil a week's worth of comics at a time using a Dixon pencil on bristol board (thick paper). After, I ink each one with a Pentel brush pen, then erase the pencil lines before scanning the strips into Photoshop, where I color and letter them. Finally, I publish to the web (which is done semi-automatically now). I do most of the writing in the evenings during the week, and the art gets done over the weekend. Brian Griggs joined as a writer in May, 2010 and contributes story ideas, punchlines and whole strips. He also manages The Kickstand's Twitter account. Brian has worked at a bicycle shop, plays bike polo, and can be found astride a tall bike at numerous events around Cleveland, Ohio. Tania Menesse serves as editor. She reviews each strip at each stage of development and says 'go' when one is ready to be published for daily enjoyment. Yehuda Moon is an idealist. A dreamer. An advocate. A utilitarian. Yehuda runs the Kickstand Cyclery with his partner, Joe King. He believes cycling is an ideal form of transportation and can often be found tilting at windmills – some imaginary, some very real. Yehuda doesn't like the automobile... but then, he'd likely wouldn't have liked the horse a hundred years ago either. Yehuda is all about momentum and hard work and staving off the ills that come with ease and convenience. Joe pursues the medal. To him, cycling is a pastime, a race to prove performance. Joe is all right with the fact that he drives to the Kickstand. He doesn't see the bike as a savior of mankind. In fact, the fewer cyclists on the road means more room for him. Joe used to race, and has always worked at the Kickstand. He wasn't too pleased when Fred (the first owner of the shop) took Yehuda under his wing, given that Moon didn't know a thing about wrenching. Thistle is a mother who doesn't want her child growing up in the back seat of a car. Though she has high hopes for the bicycle being a transportation choice for more and more people, she's more balanced in her approach than Yehuda. An ace engineer, Thistle never went back to work at her old firm after discovering a bakfiets at the Kickstand. She works there wrenching while she raises Fizz (though events of late point to her having to return to her old job). Fizz is Thistle's daughter. Fizz is growing up in the Kickstand Cyclery. She's about to move on to two wheelers. Watch out. Sprocket was an orphan adopted by the Shakers who build the bicycles for the shop. She grew up simply, and hasn't changed. She rides a brakeless fixed gear mixte. She paints the Kickstand's bicycles and designs the decals for the different models. Fred opened the Kickstand Cyclery back in the 1970s during a 'bicycle boom'. He hired Joe King and the two ran the shop until Yehuda Moon showed up intent on turning everyone into a cyclist. Fred took Yehuda under his wing despite the fact that Moon had no experience as a mechanic (much to Joe's chagrin). But then Fred was killed by a motorist and Yehuda and Joe worked together to keep the Kickstand open. Yehuda, using a personal war chest, bought the Kickstand; he and Joe continue to run it today. Fred haunts the Kickstand as a ghost, and though he found peace with his murder, has returned to town when the Kickstand was recently burned to the ground. Brother Pilot leads the Shaker community that builds the Kickstand Cyclery's bicycle frames. Pilot took a vow of silence when Fred was killed by a hit and run driver; he won't speak until the driver is brought to justice. Sweetroll and Yehuda Moon used to run BMX bikes in the sewers below Cleveland. Now he's grown up. Yehuda hasn't. The Kickstand Cyclery is where everything goes down. A converted train station between urban rails, the Kickstand serves as the hub for all things in the comic strip. It's where Fred's ghost bike was placed. It's where Thistle's 'build-a-bike' program was put into action. It's where Yehuda sleeps. At least until recently – the Kickstand was burned to the ground when a tree hit it and was ignited by downed electrical lines. While Yehuda and Joe sort out what's going to happen with a new shop, the Kickstand has gone mobile; the two run a mobile repair stand out of a pair of bakfietsen. Look for new character profiles soon – like Kevlar Bead (owner of Rival Cycles).